St Michaels Mount, Cornwall; where you can walk out to the castle at low tide and walk up lots of steps and look at a castle from where the first alarm was raised of the Spanish Armada's approach, and you can walk through a beautiful garden with lots of succulents and other plants. 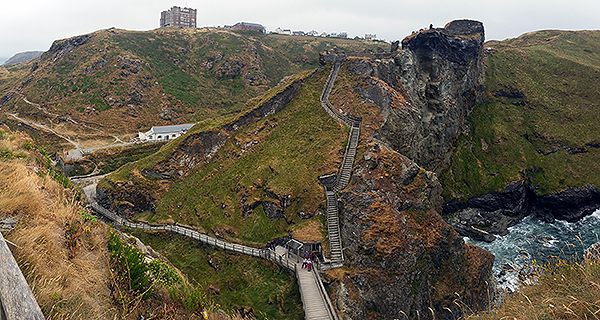 The view from Tintagel Castle, where King Arthur was supposed to have been born. He wasn't (look it up) - but the area has been inhabited since about 500 AD. I took 32,000 steps that day, according to my phone's pedometer. Just because I'm not in Australia, doesn't mean I can't hassle you! Have you signed up yet? We have to make sure that the Five Dock teams have plenty of competition! I hope you're all practicing? We've already started before I left, but there's a lot more work to do! Keep practicing! Make sure you practice all the kata you need to know, both as individuals and teams. Google+ Click on Review at the right hand side.